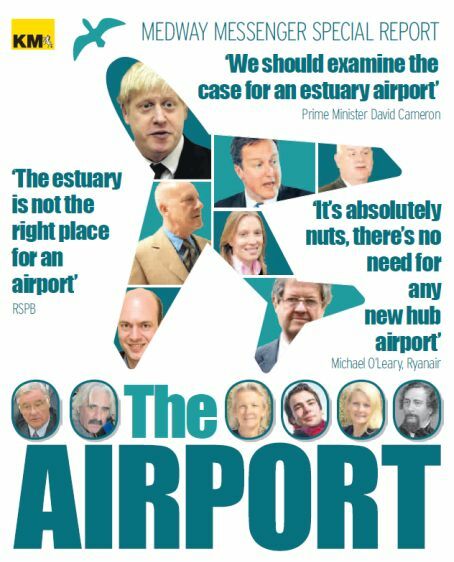 A weekly newspaper has produced a detailed supplement about controversial proposals which could see a new airport built in the Thames Estuary. The Medway Messenger published the 16-page special report after gaining the views of politicians, campaigners and supporters of the possible new airport. Residents have been faced with the prospect of an international hub for more than half a century and options are being now being considered by the Davies Commission on aviation, which is due to issue an interim report later this year. Reporters Dan Bloom and Alan McGuinness compiled the detailed supplement, which was published in last week’s paper. Editor Bob Bounds said: “We don’t always have the chance to have a really good look at a major issue like this but this was a subject we just could not ignore. “We’ve covered it extensively before, of course, and even carried out our own poll which revealed that while most are against, there is a sizeable minority who want the jobs and investment an airport would bring. For the pull-out, Alan interviewed Boris Johnson, who was doorstepped on the steps of Portcullis House, Lord Foster and John Olsen, the man behind a £12bn airport plan. The supplement also included detailed graphics showing all the airport options, plus a timeline which was presented on a luggage conveyor belt. Manston has one of the longest runways in Europe apparently. Which building company is handing out the well-stuffed Manilla envelopes?? The wonder of Google Earth is that it allows you to measure runway lengths. If you have a look at Manston’s runway you will see it is 2.75km which is considerably shorter than any major airport such as Gatwick, Stanstead or Heathrow. Manston may have had one of the longest runways in Europe when it was built during WW2 but it is a long way down the league today.